Georgia's Home Inspirations: Fall Decorating! Autumn has always been my favorite season. Nature bursts with beauty, we transition into comfort food like soups and pumpkin lattes and cool weather calls for cozy sweaters and boots. 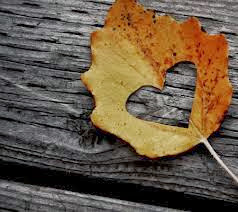 When fall arrives, as it officially does on Sunday, I get excited looking forward to the upcoming holidays. 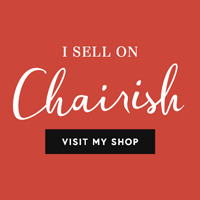 I love everything about Halloween, Thanksgiving and Christmas from decorating to baking to finding the perfect gift for a loved one. 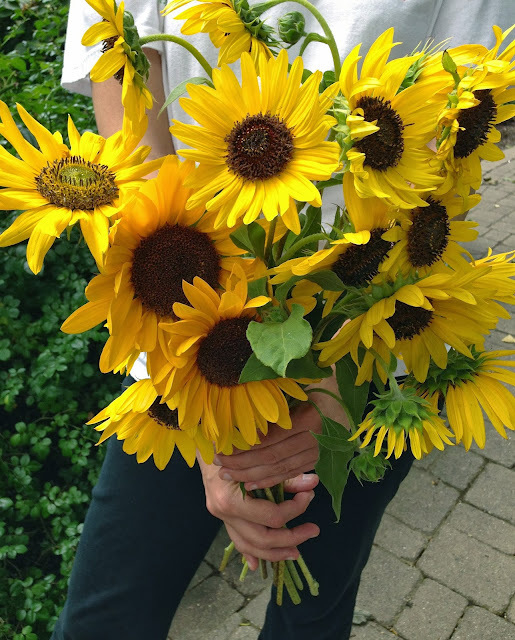 Nothing is more cheerful than a bouquet of Sunflowers! 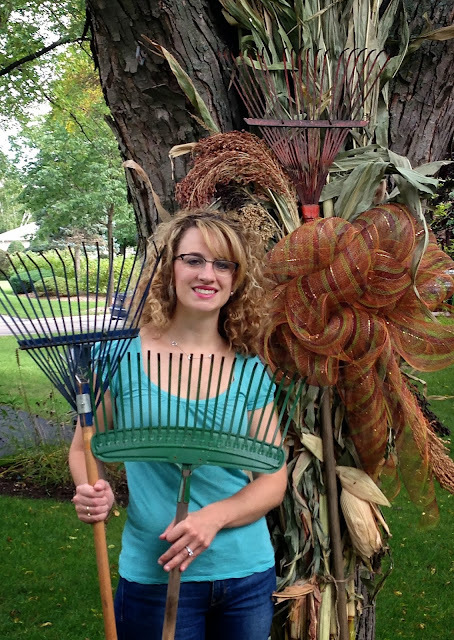 Decorating with cornstalks is always fun. We added a vintage rake, broom corn and a mesh bow for flair. 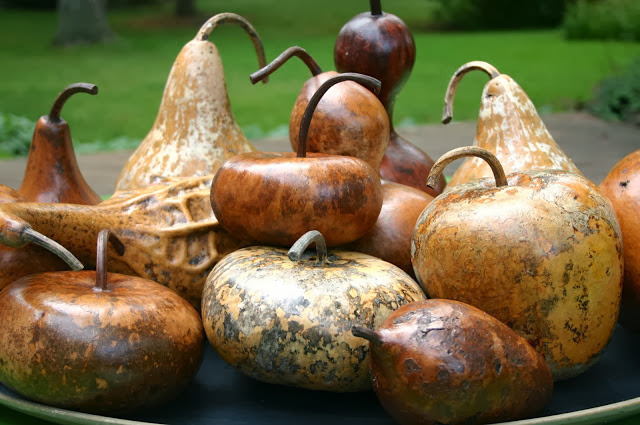 Dried gourds can be enjoyed through November. Create a centerpiece with different shapes and sizes or nestle one on a mantle, sideboard or bookshelf. 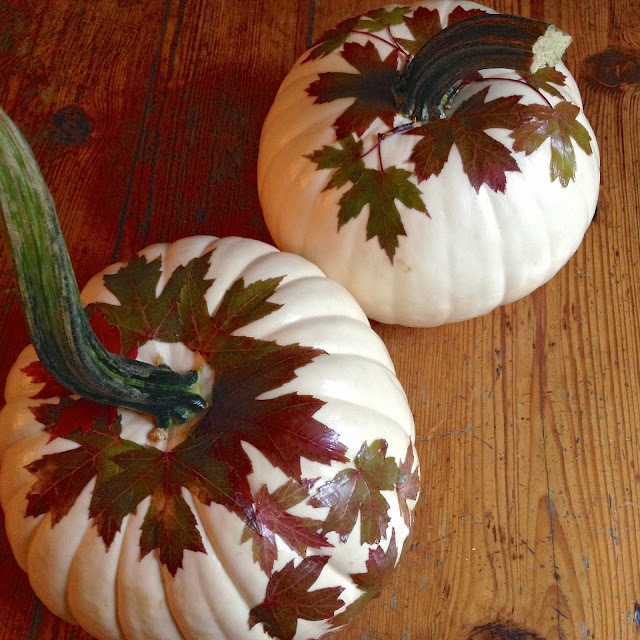 Decoupage a white pumpkin with fall foliage. Georgia's saw this idea in Country Living magazine and decided to give it a try. We used Mod Podge and newly fallen leaves, but you could easily use artificial ones - fun for all ages! This vintage garden chandelier looks festive adorned with mini pumpkins! 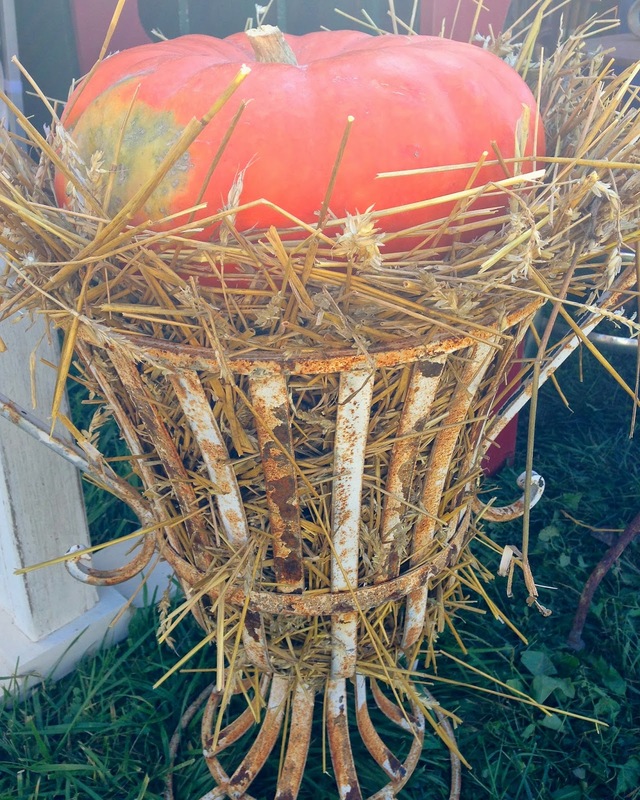 We saw this vintage planter decked out for fall in the wee hours of the morning at the Ohio Country Living Fair. What an inspired use of straw! Love this stack of Cinderella Pumpkins formally known as "Rouge Vif D'Etampes." 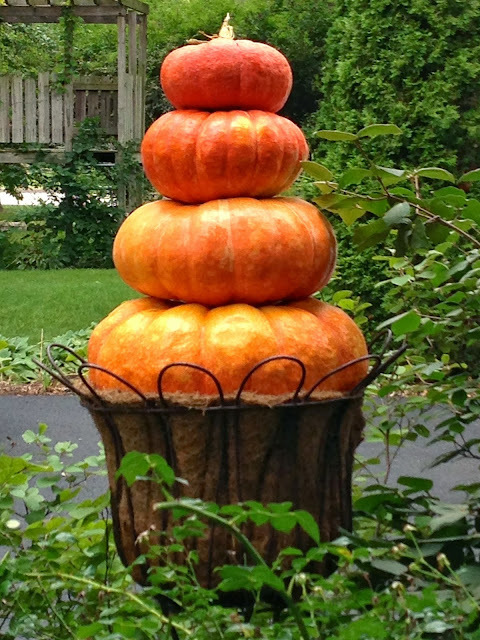 The nickname comes from the notion that they resemble the pumpkin that was transformed into a coach by Cinderella's fairy godmother. They do have "magical" appeal, don't they? This antique goat cart with original green paint just begs for pumpkins but would also look great filled with mums or straw and a scarecrow. 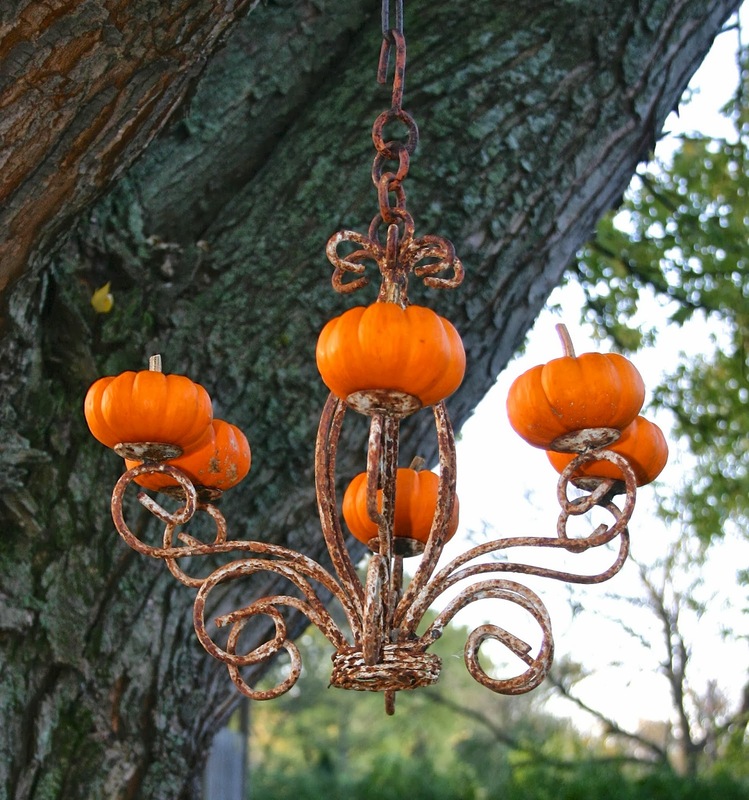 Do you have a great fall decorating idea? Share it with us; we'd love to hear from you!